So, I feel a bit under prepared for this task. Last week, I had an experience that all wine connoisseurs should have at one point in their life. Put simply, I went to a wine museum. What is not so simple is that it claims to be one of the largest and most extensive tributes to wine in the world. Nestled at the foot of the Sierra de Cantabria Mountains is a small town named Briones. Located in Rioja Alta about 5 kilometers from [Haro->http://www.haro.org/], [Briones->http://www.brioneslarioja.com/modulo/index.htm] is smack dab in the in the epicenter of the majority of La Rioja vineyards. Scenic, beautiful and small, the town was probably no more than a cathedral on a hill to tourists before the museum was built. Consequently, I was a bit surprised when I was told that you needed a reservation to visit. Though this seemed a bit ridiculous, considering the location, the representative at the Tourism office booked me a one person tour for 3pm that afternoon. When I arrived, I was greeted by a nice gentleman who spoke very good English and flashed a smile that made you feel welcome. Before I began the tour, they explained the layout and what to expect from the museum. Yeah, yeah, yeah, I’ve been to museums before, and was expecting from the looks of it a fancy rehash of wine display’s that I had seen before. After taking my ticket and stowing my bag (no cameras), I walked up to the entrance; my first indication that this was not to be any ordinary wine experience. I waved my ticket under a laser scanner and was let into a room empty save a few short benches. As I moved forward, the lights began to dim and I was greeted in English by the owner of [Dinastía Vivanco->http://www.dinastiavivanco.com/] who gave a short 15 min presentation about their vineyards and the reasons behind building the museum. Leading you through the vineyards and surrounding areas with some of the most amazing scenic footage of Rioja, the film helped to focus your attention away from the world outside and started you thinking solely about wine. So far, so good! At least I wouldn’t be too bored. Finishing the film, the lights came up and I walked out into the first gallery of 5 total. With dramatic lighting and sounds of the land all around me, I was led by arrows through an impressive display of the first origins of wine. Ancient serving vessels, tools for harvesting, wine presses, a multitude of vineyard management tools and much, much more. This was not a boring “Oh look at the old thing there” tour, but one created to educate you by showing and explaining every detail of wine making from the far past to present day. About half way through the first gallery, I came across 3 large movie screens, with a synchronized video showing the life of the vine from winter through fall. Set to ambient sounds of the vineyard, you are transported out of the museum and into the vineyard finding yourself lost in the vine’s life cycle. As you finish the film you are snapped back into reality, and you continue on to learn what needs to happen to make this vine’s grapes give you wine. With the dim lighting and focus on detail you rarely find yourself without things to look at including towards the end of the first gallery an audiovisual display of the process of fermentation from a grape’s perspective! Complete with sounds. You can almost smell the must ferment, and part of me wonders if they might be pumping in smells to help make the experience more real. Agog, and not needing to be impressed further, I still had 4 galleries to explore. Descending a ramp that wound like a vine throughout the entire building, you begin to hear sounds of chainsaws and hammering. Rounding the corner, three videos are explaining how the essential tools to craft wine are formed. Examples of barrel making from tree to barrel, bottle making from sand to bottle and cork making from tree to cork all are captured on video for you to watch. Each video so thought out and detailed that I found myself getting lost in each one unsure of where I was. What makes this place special is that the questions no one ever thought to ask are answered here. While I have studied the process of barrel, bottle and cork making in the past, to actually see the processes helped to make it more real for me. In all of the films, the most captivating aspect was the lack of voices or commentary. Watching the barrel formed from a log to a barrel without voices sucked me in, whereas a loud voice explaining the next step might only confuse me and break the magic. Though there were plenty of texts in English and Spanish to explain everything you looked at, there were no vocal explanations. In this way, they made the experience more visceral allowing the wine to speak in its own voice, a universal one. In awe, I slowly wandered out of this gallery. Winding further down into the 3rd gallery I was greeted by ancient stone and wood grape presses, some bigger than a semi-trailer towering over whomever passed them. The presses were surrounded by more displays of wine – my favorite being the interactive ones in the back right corner, which meticulously explained the parts of wine that you can only experience from tasting. A daunting task for any normal museum but taken in stride here at Vivanco. In a state of the art display looking more like a space station cafeteria, sat a wall of bright images above a series of small domes. To the side of the domes were small strips of paper. The goal of the display was to have you push a small button in front of the dome causing the lid to rise, and with your paper strip, rub it across a small wick that sat inside. Putting the strip under your nose, you could actually smell the aroma displayed in the picture above the dome. There were 28 different aromas, from anise to petrol to honey, and for the most part, all were very accurate interpretations of there respective flavors. A big touch screen followed the scent domes where you could play games to test your wine knowledge. For instance, can you accurately place common smells with specific wines? Part of me thought I had been transported to a children’s museum for adults. With so much to see and look at I was already becoming fatigued from walking and reading. I found myself skipping over some of the displays in hopes that I might return someday to re-examine them. If I had one complaint, so far, it would be that I was not warned at the immensity of this display. Had I known, I might have scheduled 2 trips. Gallery 4 was the only traditional gallery that I experienced. Inside was a mausoleum to all the ways wine has been depicted in art throughout the ages. From Egyptian hieroglyphics, to Picasso this was the Prado in miniature and with a very specific scope of interest. On top of paintings, sculptures and mosaics in one corner there is a small room with a video showing how wine had been depicted in cinema. I have to say I was becoming to realize that this was more than a wine museum. This was a monument to wine and a gift to those who love it. With my mind about to explode from over stimulation it was nice to have a short respite in the form of the Dinastía Vivanco Crianza barrel aging room. Cool, calm, dimly lit and with the rumblings of what sounded like storm troopers in the distance this octagonal shaped room looked more like a set from an epic Hollywood movie than a wine cellar. All the barrels were ordered in neat stacks and because the room was in the shape of an octagon, it gave the impression of infinite space. Standing and looking around this room, I stopped and let my mind wander a bit before the final assent to the last gallery. Enter the corkscrew! Ever look at a corkscrew and find it interesting, maybe thinking to yourself that at some point you might want to start a collection. I mean, really, how many different types of corkscrews could there be? Well, the last gallery answered the question with a resounding 2000 give or take a few. As if the number wasn’t astounding enough, they were grouped according to theme, epoch and design. Having only been in use for around 300 years, there have sure been a lot of modifications to this simple object. For example, they have been fashioned into everything from walking canes with them hidden inside to pornographic corkscrews where the god Pan has a screw where anatomically he shouldn’t all arranged on tall walls that made viewing easy and surrounding a center space that held a somewhat smaller tribute to decanters. With my head swimming in wine, I stumbled toward the exit where, once again, where I needed to wave my ticket under a scanner to release me from the confines of the galleries. Walking out, I was led to a bar to try the Dinastía Vivanco Crianza. In order to celebrate a nice end to a long journey, the wine was well appreciated and helped me unwind. In my life, I have learned a lot about wine and know that I have much, much more to learn before it is over. But I consistently run into displays about wine and its culture that bore me with the details of fermentation or “how to taste”. Vivanco did not. It actually helped me feel alive and excited watching and learning how a wine is made from grape to bottle. Magical, academic, and reverent, Dinastía Vivanco has something to offer everyone. No matter how much or how little you know, ANYONE who loves wine will learn or see something that they did not know before. I only hope that everyone with any interest no matter how remote in wine has the chance to one day pay homage to this tribute. 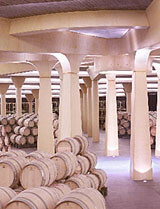 For people in the wine trade, there is also a large library of texts for research and a small cafeteria accompanied by a high end restaurant featuring wines of the region. As I left, it was raining and I wasn’t able to wander the grounds outside, but I did leave with great memories and a desire to return. This will stand as one of my top ten wine experiences renewing my desire to make wine a permanent part of my life.